Leading lifestyle content developer for television and the Internet reinvigorates HQ lobby with state-of-the-art 8’ tall x 15.5’ wide 1.2mm pixel pitch NanoLumens Nixel Series™ LED display. As a leading creator of engaging lifestyle television and digital programming, Scripps Networks Interactive knows the power of impressive visuals. So, when the company recently began to feel that the lobby in its Knoxville, Tennessee headquarters lacked a certain impact, sizzle or ‘wow’ factor, they decided to give it an exciting visual update. To do this, they implemented a redesign that was completed in March 2017. They hired the nationally known video collaboration and strategy company Whitlock to install an 8’ tall x 15.5’ wide 1.2 mm pixel pitch Nixel Series™ LED display from NanoLumens, the award winning creators of uniquely compelling interactive LED visualization solutions. According to Whitlock Account Executive Erica Fox, Scripps Networks Interactive felt the space seemed out of date, and it was her job to come up with ideas and a concrete solution to deliver an ultra-modern video presentation solution that would shine in 2017 and for years to come. 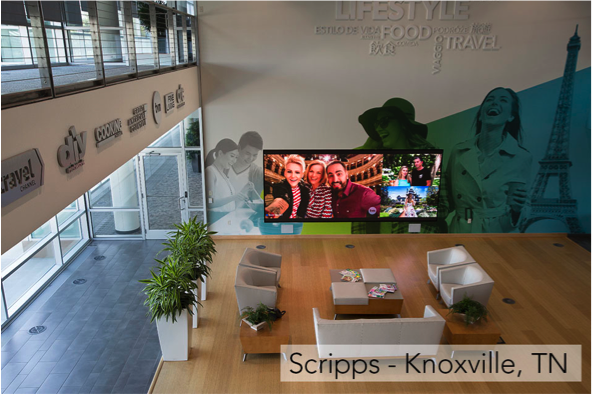 Having previously specified NanoLumens LED display solutions, she knew the company would provide exactly the type of engaging and exciting visual experience Scripps Networks desired. This goal of long-term relevance led Greg Moore, Scripps Networks Interactive’s Director of Facilities Project Management, to increasingly push for the latest, most technologically advanced video display solution. After learning about NanoLumens’ innovative LED displays through Fox, Moore visited the NanoLumens headquarters in Norcross, Georgia to gain a first-hand understanding of the different options and benefits offered by each NanoLumens solution. In addition to the need for a long-lasting, impressive display technology, the brightness capabilities of NanoLumens’ technology proved important to achieve improved visibility in the often washed-out installation location. As a ground floor lobby with two-story windows, ambient light can be intense throughout the day and affect the visibility of digital displays. Another core benefit was the front-serviceable design of NanoLumens displays, made possible through the use of the manufacturers’ patented NixelTM technology, which are small panels of LED pixels that piece together seamlessly to form displays of any size, shape and curvature. Individual Nixels can be removed and replaced if necessary, greatly reducing maintenance time and costs. For the actual use of the display, Whitlock utilized a Crestron control system and interface to provide simple operation and satisfy a multitude of use scenarios, including presets for live presentations in conjunction with installed in-wall speakers and a microphone. Through the control system, operators can project a single image or video on the entire LED display or stream 10 live TV channel feeds to ‘windows’ on the seamless display in a variety of configurations. There are also overlapping modes, where windows vary in size and sit on top of each other digitally, providing a sense of 3D layering, much like windows on a computer screen. Programmed presets allow these changes to be made instantly with little effort, even from a mobile device or PC through a virtual X Panel Whitlock designed and delivered. This provides an extra layer of insurance against equipment issues, in case the Crestron panel fails for any reason. Fox also noted that this project was aided by the technical knowledge of Doug Price and Eric Seigler, so that on both the purchasing and selling sides, there was always a clear understanding of the technological needs, capabilities and usage scenarios to be considered. Newer PostAdvanced Tech Day Will Introduce New Google Jamboard Collaboration Tool to Customers!